Tescott's Kyle Comstock has rushed for more than 100 yards in each of the last three weeks including 137 yards with four touchdowns in last week's heartbreaking 34-32 loss to Goessel. The Trojans should have the edge over the Chase Kats this week in their third district game, but their two toughest opponents, Hope and Southern Cloud, await in weeks eight and nine. While Comstock may find some tough going those final two weeks of the season, he should find some running room against Chase in a game that could light up the scoreboard. The 5-0 Tigers, who are ranked No. 5 in 2-1A, are averaging 49.2 points per game on the season and have scored at least fifty in four of their five contests. They will face Jayhawk-Linn in a district match-up on the road on Friday. The Jayhawks (2-3) are giving up 36 points per game on the season and Lyndon should be the best team they have faced up to this point. Lyndon has put up 553 yards of total offense per game in 2013, featuring a balanced offensive attack (332.8 rushing per game, 220.8 passing per game). Expect them to keep rolling this Friday. Just a sophomore, Norris (5-11, 160) is one of the most talented offensive eight-man players in the state. He has already surpassed his freshmen totals from a year ago when he passed and rushed for more than 700 yards and scored a combined 17 touchdowns. This season, he has passed for 1,173 yards and 19 touchdowns against only four interceptions. A true dual-threat quarterback, Norris also leads the Eagles in rushing with 713 yards and 11 scores. He threw for 289 yards and six touchdowns and added 197 yards rushing and three more scores as Norwich picked up their first win last week, 70-22 over Cunningham. He should have another strong performance this week as the Eagles step outside of district play to take on a Goessel (2-3) team that is surrendering more than 48 points per game. Almena-Northern Valley had high expectations entering the season after it returned three rushers who gained at least 800 yards for a 7-2 team last fall. The Huskies have opened 2-3, but it’s mainly been run defense and special teams woes that have led to losses. Northern Valley has averaged 38 points per contest, second-most among Eight-Man, Division II teams with a losing record. 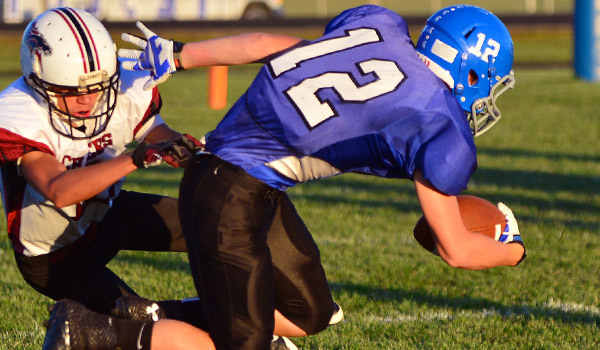 This week, the Huskies play host to Natoma (4-1) for Homecoming in a key district matchup. Senior Ian Vincent, a four-year starter and arguably the best lineman in Chuck Fessenden’s 37-year history, suffered a season-ending ankle injury in a loss to Beloit-St. John’s-Tipton last week. However, the Huskies still have plenty of talent up front including juniors Ame Baird and Carson Montgomery, each returning starters. Northern Valley has averaged 296 rushing yards a game. Tempel has been a dual threat for Garden City this season. He has passed for 961 yards and 10 touchdowns, while rushing for 748 yards and 12 touchdowns. In last week's 61-20 win over Liberal, Tempel passed for 143 yards and four touchdowns and rushed for 290 yards and five touchdowns. Tempel will be a key for the Buffaloes when they face Wichita East on Friday. Willis (6-4, 190), the Stags’ junior signal caller has been putting up big numbers all season long. This week Miege hosts Blue Valley West in a must win for the Jaguars. Defenses in the EKL have struggled to stop the high-scoring attacks in the league all season and this could be another high-scoring shootout.